I thought it took about 25 days for the sun to do a rotation at the equator, but AR2736's rapid progress across the solar disk and disappearance was certainly a good deal faster than that. What gives? 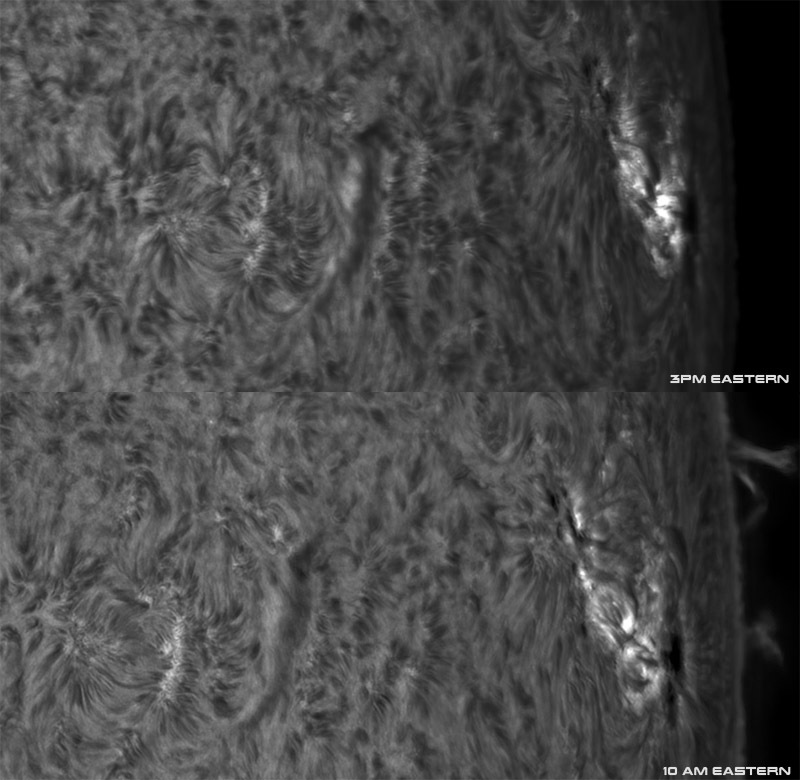 I even followed it for a while with the SOLAR GONG and AR2736 seemed to be in a different position every time I Iooked--each time a little closer to the limb. Seems like it will be gone by noon tomorrow. And to those who are dropping in it would be nice to know what if any filters, for visual use, do good things in conjunction with a Baader white light filter or a Daystar Quark. About all I know is that a variable polarizing filter sharpens up solar chromosphere features in conjunction with the Quark. I don't know if I'm missing any other tricks. When AR2736 appeared it was already well past the solar CM. So it didn't have too far to go to get to the corner. Well that helps. I had been assured that they rotate into view and don't just pop up out of nowhere. I was dubious because that would mean that they always pop out of nowhere somewhere that we happen not to be able to see. But I couldn't say much because when I'm "down" for days at a time I can't be sure what happened earlier. It's still on the limb now, just flared an hour ago again. Still plenty to see. Activity is waning though. There's still a few more hours on the limb before you cannot see the spot's umbra anymore. I imaged this morning at 10am and again at 3pm (Eastern Time) and the change of the spot to the limb is noticeable, but still lots of room to view and see it. Edited by MalVeauX, 23 March 2019 - 04:10 PM.